Repent! The Church of Robotron Accepts All! Are you the mutant savior? Are you prepared for the robot uprising of 2084? Have you accepted robotron into your life? The Church of Robotron is now conducting training, testing, and confession at the new window altar in downtown Portland. The Church of Robotron is the fake totally legit religion based on the classic arcade game prophecy Robotron 2084. In keeping with the church’s views on community outreach and missionary work, a Robotron altar has been installed at the Diode Gallery for electronic arts. The altar consists of a system running Robotron 2084 with capacitive sensing controls built by DorkbotPDX’s own [Phillip Odom]. He’s using the same techniques featured in his capacitive sensing workshop, allowing the game to be played 24 hours a day. There are also monitors displaying the leaderboard and tenants of the Church of Robotron. The Church of Robotron has also been showing up at Toorcamp for a few years now, with an even more spectacular altar that triggers physical events in response to game events. That’s a very cool use of MAME’s debugger, and a story worthy of its own Hackaday post. Video of the altar below. The office environment over at [Adam]’s place of employment has recently become one of the many IT-related offices with a ping pong table, a cliché that he readily points out. However, [Adam] and the other folks at the office decided to step up their game a little bit by making this automated ping pong table. The table first keeps track of the players with specialized RFID tags that are placed in the handle of the paddles. The paddles are unique to each player, and when they are swiped past a reader on the table the scoring system registers the players at the table. Small capacitive touch sensors on the underside of the table allow the players to increment their score when a point is made. The scoreboard is a simple but a very well-polished interface that has audio cues for each point. The system is also able to keep track of the winners and the overall records are tracked, allowing for office-wide rankings. This is the best table-related game hack since the internet-connected foosball table, and should be welcome in any office for some extra break room fun at work! All of the code is available on the project site. The pen is mightier than the sword, but the IBM Model M keyboard, properly applied, can knock teeth in. There are a few more IBM keyboards even better suited to blunt force trauma – the extremely vintage beam spring keyboards made for terminals and desktop publishers. Being so very old, there’s no easy way to connect these keyboards to a modern system, so when [xwhatsit] wanted to make his work, he needed to build his own controller. The beam spring keyboards use capacitive switches, and with 122 keys, the usual method of reading capacitance – putting a capacitor in an oscillator – would be far too slow to be of any use in a keyboard. There is another method of reading capacitance: measuring the current going through the capacitive switch. This can easily be accomplished with an LM339 comparator. [xwhatsit]’s keyboard controller uses this capacitive sensing circuit to read the four rows of keys, with a few shift registers taking care of the columns. An ATMega32u2 is the brains of the outfit, running LUFA to translate the key presses to USB. If you’re lucky enough to have one of these ancient keyboards, [xwhatsit] is selling a few over on the usual mechanical keyboard forums. There’s also a controller for the Model F keyboard using the same basic circuit. If you need one just drop him a line or grab the gerbers and roll your own. It has been a while since we wrote an article about our ongoing offline password keeper project, aka the Mooltipass. Our last post was asking our dear readers to vote for their favorite card art, so what have we been doing since then? For the last few weeks we’ve mostly been improving our current PCBs and case design for the production process to go smoothly. The final top PCB shown above has been tweaked to improve his capacitive touch sensing capabilities, you may even see a video of the system in action in the Mooltipass project log on hackaday.io. We’ve also spent some time refining the two most popular card art designs so our manufacturers may print them correctly. We’ll soon integrate our updated USB code (allowing the Mooltipass to be detected as a composite HID keyboard / HID generic) into the main solution which will then allow us to work on the browser plugin. It’s also interesting to note that we recently decided to stop using the GPL-licensed avrcryptolib. Our current project is CDDL licensed, allowing interested parties to use our code in their own project without forcing them to publish all the remaining code they created. The GPL license enforces the opposite, we therefore picked another AES encryption/decryption implementation. This migration was performed and checked by our dedicated contributor [Miguel] who therefore ran the AES NESSIE / CTR tests and checked their output, in less than a day. 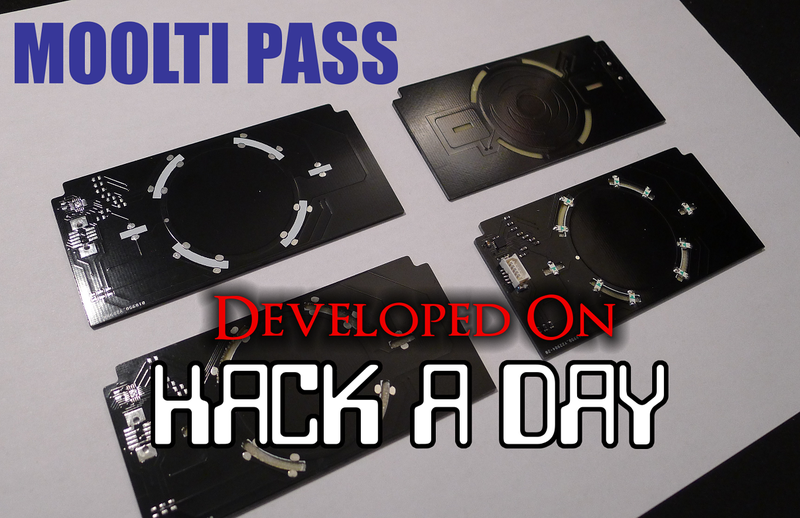 We’re about to ship the first Mooltipass prototypes to our active contributors and advisers. A few weeks later we’ll send an official call for beta testers, just after we shown (here on Hackaday) what the final product looks like. Don’t hesitate to ask any question you may have in the comments section, you can also contact us on the dedicated Mooltipass Google group.